In addition to the primary room block at the (highly recommended!) conference hotel, WWW2007 has secured overflow space at 10 other Banff hotels. These are all clean and comfortable hotels, with a variety of amenities. Room rates range from about $100 CDN per night to about $300 CDN per night. All hotel rates in 2007 are subject to 2% Tourism Improvement Fee (TIF), 4% Alberta Hotel Tax, and 6% Goods and Services Tax (GST). Please book early! There are lots of hotels in Banff, but with WWW2007 and PIASS both taking place the same week, it could be hard to find a room! The room release date for most of these hotels was April 5. What this means is that any empty rooms remaining on that date are released back to the hotel to sell to Banff tourists. Rooms will be available on a space available basis only. Please make sure that you have lined up a place to stay during WWW2007 before the rooms are released to the general public! Update (April 21): The contracted release date for all remaining hotel properties is imminent. 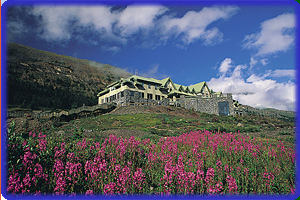 WWW2007 will be retaining only one overflow hotel, namely the Tunnel Mountain Resort, which currently has the most rooms remaining. WWW2007 attendees still looking for a hotel room are encouraged to try this one first. Note that bus transportation will be provided each morning from the Tunnel Mountain Resort to the conference hotel (Fairmont Banff Springs). This page summarizes the important information for each hotel, including the room rate and the number of rooms available for WWW2007. When making a reservation, please identify yourself as a WWW2007 attendee to receive the correct rate. Please visit the individual hotel Web sites for additional information. The following list is in increasing order of distance from the WWW2007 conference hotel. Please note that the Fairmont Banff Springs Hotel is on one side of the Bow River, while all other hotels (and the main Banff townsite) are on the other side of the river. Walking time could be 30 minutes or more to get to or from the conference hotel. Banff transit service is available from some hotels. WWW2007 rates are extended to delegates two days prior and two days after the contracted convention dates on a space available basis. Reservations require a valid credit card number or a cheque or money order for advance deposit made payable to Banff Park Lodge. Reservations and deposits must reach the hotel at least 45 days prior to arrival. Any request for additional space after March 24, 2007 will be subject to availability; the negotiated group rate will still be honoured. For triple and quad accommodation, additional guests (over the age of 16 years) are charged $15 per person per night plus applicable taxes. A maximum of 4 adults are permitted per room. Underground parking is available at a cost of $7 per day for self-parking, and $11 per day for valet parking, plus GST. Individual deposits are refundable if the notice of cancellation is received by the Banff Park Lodge 72 hours prior to the date of arrival. WWW Conference delegates should note and retain the cancellation number quoted to them by the agent at the time the cancellation is made. Indoor saltwater pool, steam room, whirlpool, and activity desk. In the heart of the majestic Canadian Rocky Mountains, just two minutes walk from downtown, the Banff Ptarmigan Inn is the perfect headquarters for those who love to ski, hike, golf, bike, canoe, raft, fish, and more. The in-house facilities include the exclusive Caribou Snow School, the unique Caramba! Restaurant, free high-speed Wireless Internet access in 95% of guest rooms and all public areas, meeting rooms and more, making the Banff Ptarmigan Inn an exceptional hotel for your next trip to Banff. All reservations must be booked by March 5, 2007. Thereafter reservations are on a space-availabile basis and subject to rate change. Mandatory service charge of $5.25 per person per night. Waived for WWW2007. Triple/Quad accommodations will be on a shared bed with an additional charge of $15 per person plus applicable taxes. Up to a maximum of two children (16 years of age or under) may occupy the same room as their parents, free of charge. Underground heated parking is available at a cost of $5 per car per day. Free for WWW2007. Two whirlpools, steam room, dry sauna, and exercise equipment. Interior courtyard. The Banff Aspen Lodge combines affordable accommodation with warm, friendly hospitality and excellent facilities. Most rooms feature private balconies and mountain views. From its convenient location on Banff Avenue, the Banff Aspen Lodge is just a three-minute stroll to the fine shopping, dining, museums and galleries. This hotel is popular with group tours for skiing and snowboarding. Storage room for equipment is available. All booking, changes and cancellations must be received in writing by fax. Prepayment is required for the full stay, with payment 30 days prior to arrival via credit card, check, or money order in Canadian funds. Children 8 years old or younger stay free with parents. Children 9 to 16 years are $5 each plus applicable taxes. Continental breakfast included in room rate. Outdoor hot tub, sauna, and steam room. Experience a restful stay amid the grand surroundings and tradition of a great mountain lodge. Classic craftsmanship has been used throughout this property including fine woodworking details, custom light fixtures, and natural granite and slate. In the style of an intimate boutique hotel, our guestrooms and suites are spacious and thoughtfully appointed. Each extra person sharing a room will be charged an additional $25 per night. There is an additional charge of 5% per person per day to cover porterage, housekeeping, and group services. Parking fee is $6 per day. Valet parking available. Grotto Spa. Small pool and hot tub. In-room fireplaces in selected rooms. The Banff Caribou Lodge is one of several properties owned by the Banff Lodging Company. The hotel's facilities include The Keg Steakhouse & Bar, a heated underground parkade, and an exercise room with 35-person jetted hot pool, a steam room, and exercise equipment. Downtown shops and restaurants are accessible via a pleasant 10-minute walk, or by the complimentary evening shuttle service. All reservations must be booked by March 5, 2007. Thereafter reservations are on a space availability basis and subject to rate change. Triple/Quad accommodations will be on a shared bed with an additional charge of $15 per person plus applicable taxes. Up to a maximum of two children (16 years or under) may occupy the same room as their parents, free of charge. Health club with 35-person jetted hot pool and exercise equipment. Brand new Red Earth spa. Outdoor playground for kids nearby. Located on Banff Avenue, the Inns of Banff has some of the best views in all of Banff. With 244 rooms this 3.5 star hotel has it all: ski rentals, award winning Wildfire Grill, indoor pool, jetted hot tub, outdoor hot pool, heated underground parking, Japanese restaurant Miki, gift shop, and more. Unused rooms will be released April 5, 2007. Triple and Quad accommodations will be on a shared bed basis with an additional charge of $20.00 per person. Up to a maximum of two children, 16 years of age or under may occupy the same room as their parents, free of charge. Rollaway beds are available at a cost of $15.00 plus taxes per night. 2% Tourism Improvement Fee (TIF), 4% Tourism Levy, 6% GST. If a room is cancelled within the 72 hour period prior to the arrival date, a penalty of one night's room and taxes is applied. Douglas Fir Resort and Chalets is a non-smoking resort located on peaceful Tunnel Mountain above beautiful downtown Banff in the Canadian Rockies. This distinctive alpine resort provides an ideal home base to explore the surrounding natural beauty. The resort offers a wide range of accommodations including studios, lofts, one bedroom condos, one bedroom loft condos, rustic chalets and large specialty suites. All units are fully air-conditioned with well-equipped kitchens and most have wood-burning fireplaces. Perfect for families, ideal for friends, and romantic for couples. Cancellations must be received by 11a.m. at least 2 days prior to arrival date. The Tunnel Mountain Resort has everything you need for a perfect Banff vacation. This 95-unit resort in Banff National Park has a wide variety of accommodations to suit every taste. The Tunnel Mountain Chalets and Rundleview Suites are perfect for the family or a getaway with friends and co-workers. The Executive Suites are ideal for the business traveller, and perfect for couples looking for a luxurious, romantic Canadian Rockies getaway. Triple accommodations: $187. Quad accommodations: $207. Extra person: $20. Children under 14 years old are free. Indoor swimming pool, whirlpool, sauna, jacuzzi, and exercise room. WWW2007 bus to Banff Springs Hotel. Tucked away on Tunnel Mountain, Hidden Ridge Resort is quiet and secluded with some of the most spectacular views in Banff and the Canadian Rockies. The modern condos and rustic A-frame chalets at Hidden Ridge Resort feature wood burning fireplaces, full kitchens and patios or balconies. Soak in the giant outdoor hot tub, barbeque in the covered barbeque area or take a stroll along one of the many hiking trails around Tunnel Mountain that start outside your door. The tranquil and secluded setting makes it one of Banff's best-kept secrets. The Banff Rocky Mountain Resort combines spectacular natural beauty with activities and amenities sure to make any visit to the Canadian Rockies memorable. We are nestled at the base of picturesque Rundle and Cascade Mountains in Banff National Park, just 4 km from downtown Banff. Rustic outdoor setting with Mother Nature at your doorstep. Individuals must supply a credit card number to guarantee their reservation. 4 standard suites, 4 studio suites, 2 one bedroom suites, 8 bedroom lofts, and 10 two bedroom suites (totally 28 guest rooms) are included in the room block on each day. The block of rooms will be held until 45 days prior to May 6, 2007, after which time 50% of the room block not picked up will be released. On April 6, 2007, any remaining unreserved rooms will be cancelled, and additional room requests will be accepted on a space-available basis. For triple and quad occupancy, the extra person charge is $15 per person plus applicable taxes. Maximum capacity in guest room is 4 people. Children 16 years and under stay free when sharing with parents. Complimentary baggage storage is available should your arrival precede guest room check-in. There is a $5 per person charge if baggage handling service is required. Hourly shuttle service (free) to Cascade Plaza in downtown Banff. Mountain health & fitness club, two outdoor tennis courts ($5 court fee), two international size squash courts ($5 court fee), indoor swimming pool, indoor & outdoor hot tubs, sauna, coin laundry. Last modified: May 03 2007.